Why are we ignoring a clear pattern among ISI chiefs? Federal Minister for Climate Change Mushahid Ullah Khan found himself in hot water following statements to BBC that IB had a secret recording of former DG-ISI Gen Zaheerul Islam orchestrating chaos during the PTI/PAT sit-ins last year as part of a conspiracy to topple the government. 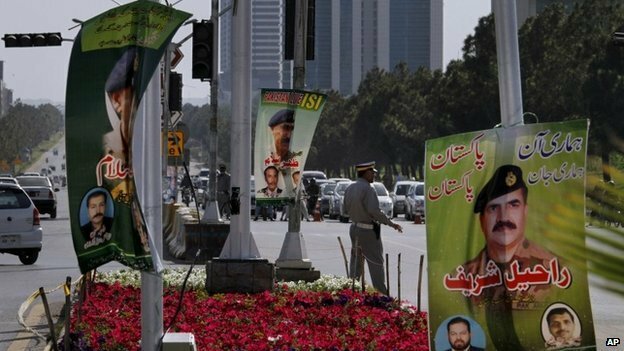 Predictably, the Minister was recalled and his resignation tendered as civil society gasped at the idea that an ISI chief would be involved in political shenanigans. But is it really so hard to believe? Historically, the ISI has been very involved in conspiracies against democracy. Former DG-ISI Hameed Gul admitted proudly that he had formed Islami Jamhoori Ittehad (IJI) as part of a conspiracy against PPP. DG-ISI Asad Durrani was implicated in conspiracy against PPP. When he was DG-ISI, Gen Kayani allegedly carried out a conspiracy against Chief Justice Iftikhar Chaudhry. Former President PTI Javed Hashmi has admitted that his party’s dharna was the brainchild of DG-ISI Shuja Pasha who had “vowed to oust Nawaz Sharif, Khawaja Asif and Chaudhry Nisar at all costs”. These are only the better known examples of conspiracies against democracy coming from the very top of ISI. So why are so-called intellectuals and analysts so quick to dismiss Mushahid’s allegations? When Husain Haqqani was accused of Memogate, he was recalled and held under virtual house arrest while thorough investigations were carried out in any attempt to prove allegations against him. Talking heads in media and politicians reversed the normal burden of proof and demanded that the former diplomat prove himself innocent of any and all charges. In contrast, another former ISI chief is once again accused of conspiracy against the government and we are pretending that such allegations are beyond belief despite a clear historical pattern of such behaviour. Instead of ignoring history, maybe it’s time we take notice of the obvious pattern and admit that there’s a problem. This entry was posted in Blogs and tagged Gen Zaheer-ul-Islam, isi, Mushahid Ullah Khan by Mahmood Adeel. Bookmark the permalink. Mushahid ullah khan was wrong, Pakistan army doing very well. i love my armed forces.